Carnage, chaos and fender benders galore? no more text messaging while driving? That’s right, in a never ending quest to make our streets safer and more predictable, we may have actually made them more dangerous and so mind numbingly easy to drive that we enable bad behaviors such as texting while driving. Let me reiterate that: The design of our streets may be partially to blame for drivers text messaging. Ever notice how much more careful you are when driving through a parking lot full of cars? Unless you really like moseying through grocery store parking lots, you’re being careful because you fully expect a car, a pedestrian or a shopping cart to pop out at any moment. You are adjusting your behavior based on perceived risk; experts commonly call this risk compensation and it is an idea that is not limited in its application to driving. For example, there has been a great deal of research that shows that children will take much greater risks when wearing protective gear and apparently traffic ‘safety devices’ serve a similar role with drivers. 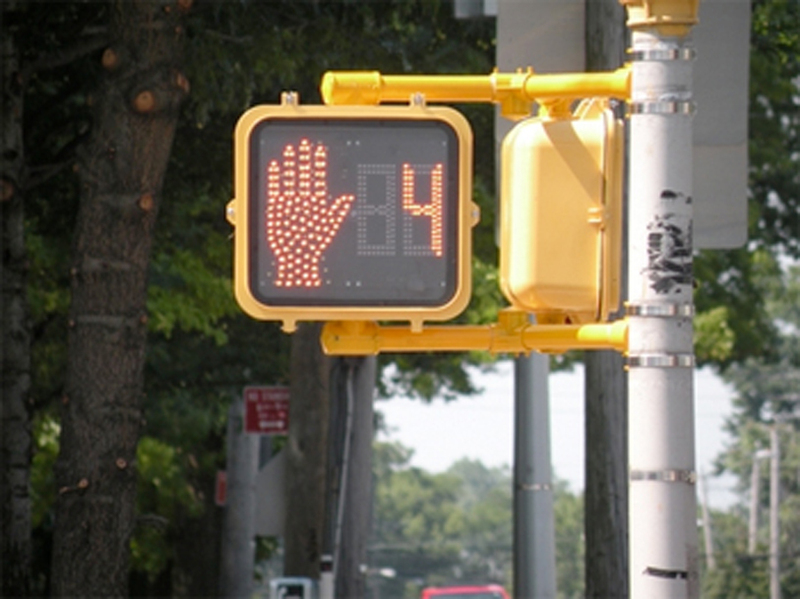 Have you ever walked into a cross walk when it says ‘cross’ without looking for traffic? How about not looking to the left and right when you have a green light and are passing through an intersection? Of course, we all have. Even though we should be as vigilant doing these things as we might in the parking lot of the HEB, we’re generally not. Instead of relying on our senses to tell us whether a situation is safe or not, we most often trust the safety features. We are thus lulled into a false sense of security and have very little risk compensation. When something doesn’t ‘match’ what the signals and signs are telling us, when we are not prepared for the unpredictable, our reaction time is even slower, and chances of an accident are even greater. With this in mind it is little surprise that most car accidents occur at traffic lights when a driver has a green light or that more pedestrians are killed in crosswalks then jay walking (Vanderbilt 178, 197). The design or actual placement of these things can also increase the likelihood of an accident because they actually focus our attention away from potential threats; traffic lights cause us to look up instead of at the road and crosswalks focus our attention ahead rather than to the left or right. These safety features along with the design and size of our roads have been shown, like the child’s protective gear, to not only diminish vigilance but to also increase risk taking behavior. For example, one well-documented study in Longmont, Colorado demonstrated that twenty-four foot wide streets are four times safer than thirty-six foot wide streets (Swift). A noted street designer, Robert B. Noland, has consistently found over a twenty-four year span that nationwide, ten-foot wide streets are considerably better safety records than twelve-foot wide streets. Why? Wider streets convey a greater sense of predictability and thereby encourage drivers to speed, pay less attention or find other means of stimulation like text messaging to alleviate boredom. Lane dividers are troublesome too? A well-documented study in England showed that when lines were present, drivers actually maintained less lane discipline and drove closer to the center of the road (and opposing traffic) than on unmarked roads (Vanderbilt 199). Need an example in Austin? Last week while riding my bike down Sixth Street I was entirely surprised to find myself accelerating to make the light as I approached an intersecting flanked by one of the relatively new countdown crosswalk timers. Have any of y’all found yourselves doing the same thing? I’d love to know. So strangely, a device meant to improve safety for pedestrians actually increases vehicular speed through the intersection while focusing all users’ attention on the timer rather than the surrounding conditions, thereby creating a more dangerous situation. Can you find any other examples in Austin where ‘traffic safety’ measures are having a similar inverse effect? On which roads in Austin do you tend to find yourself compelled to drive faster or are bored enough that you’re likely to do something you probably shouldn’t? Post your findings or observations here, I eagerly await your findings. Next week in the Weekly What If? Why are deer carcasses are more effective for slowing traffic than deer crossing signs? Are there really places other than obscure Dutch towns that have designed uncertainty into their streets, thereby improving safety and livability? In the meantime, if you are interested in reading more about this topic, I highly recommend Tom Vanderbilt’s Traffic: Why We Drive The Way We Do And What It Says About Us. I have drawn from many sources and research for this article but Vanderbilt’s book neatly brings much of this research together into a clear and enjoyable format. David Engwicht also has some great downloadable resources on his website: www.lesstraffic.com. I will share more information on related people, resources and organizations next week. Vanderbilt, Tom. ‘Traffic: Why We Drive The Way We Do And What It Says About Us.’ Knopf: New York, 2008. Peter Swift, Dan Painter and Goldstein, Matthew. ‘Residential Street Typology and Injury Accident Frequency’. Congress of New Urbanism Conference Presentation, 1997. The Weekly What If? is a new weekly column by Alex Gilliam. Alex Gilliam is the founder of Public Workshop, an organization dedicated to helping individuals, schools, and communities achieve great things through design. The Weekly What If? focuses on re-imagining various aspects of how Austin, as a city, functions and feels. The goal is to foster a larger conversation about the present and future shape of our City. Tags: austin, make austin weirder, The Weekly What If?